Drs. 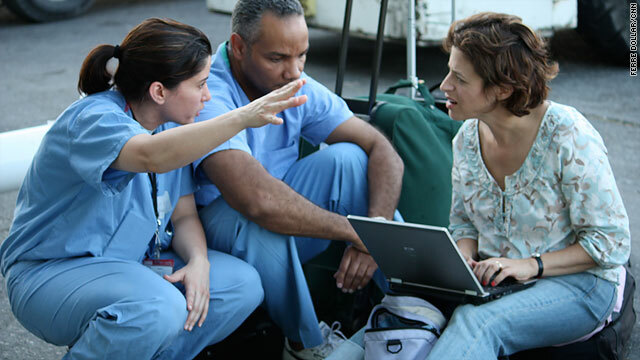 Hiba Georges and Roberto Feliz, both from the Boston Medical Center in Massachusetts, talk to Elizabeth Cohen about the difficulties they encountered while trying to treat patients in Haiti. Port-au-Prince, Haiti (CNN) -- Dr. Roberto Feliz and Dr. Hiba Georges were quickly jolted from the most modern of medical care in Boston, Massachusetts, to the most rudimentary of care when they flew to Haiti last week to work at a hospital housed in two tents run by the University of Miami. The doctors, who worked at the Boston Medical Center, quickly learned that when you have no technology -- not even the simplest blood test -- you have to make medical decisions in an entirely different way. The first death they witnessed taught them a valuable lesson. The patient was a boy who needed his leg amputated or else he would die of either an infection or rhabdomyolysis, a kidney disease that follows injuries where muscles are crushed. Feliz, Georges and the other doctors had nowhere to take the boy. Their own hospital had yet to open its operating room, so they spent hours trying to find a hospital that could do surgeries. Their search was in vain. Finally, the doctors decided to do the surgery themselves that night by the moonlight under a mango tree. "We just sawed his foot off. We didn't have to use anesthesia because he was already unconscious and wasn't feeling a thing," Feliz says. But they'd waited too long. The boy took his last breath during the surgery. "Some of the doctors cried," Feliz says. "I told them, 'There is no crying in medicine.'" As a direct result of the boy's death, a few hours later, at 3 in the morning, the surgeons at the University of Miami hospital decided to build their own operating room. They had no surgical lights, no oxygen, no blood, no ventilators and no monitors. For a tourniquet they used one of the doctor's belts. "We'd been waiting to build the operating room until we received better equipment, but after that boy's death we became more aggressive. We said let's do it, because they're going to die anyway," Feliz says. I came here a very fancy doctor, and I'm leaving here as a humble man. The doctors continued to learn lessons about what one had called "civil war medicine" after the operating room went up. At one point, a 16-year-old boy needed an amputation, but the surgeons asked Feliz and Georges to make sure the boy's kidneys were working before they put him through surgery. Without any blood tests to assess kidney function, the only thing they could look for was urine as a sign that his kidneys were working. "We tried to see if we could get some urine going, but there was not a drop. We filled him with fluids and gave him Lasix, a diuretic, to get him to pee, but nothing," Feliz says. The boy died as the doctors were treating him. "I saw a lot of deaths there, but this one hit me the hardest," he says. "I texted my wife back at home, 'I've had a bad day.'" After that boy's death, surgeons were quicker to give permission to amputate, Feliz says. Feliz says if there's any silver lining to practicing such rudimentary medicine, it's that it made him a more humble doctor. "Back in Boston, I'm a hot shot. The nurses have to respect me," Feliz says. "Here, I'm just a worker bee. I cleaned the OR floor after surgery. I carried dead bodies down the street. I was in traffic carrying dead bodies. That makes you human. I came here a very fancy doctor, and I'm leaving here as a humble man."